Born in a tenement on Mulberry Street in Manhattan's Little Italy, and raised in another in East Harlem, Lucy grew up in a large family whose matriarch cooked enormous Italian meals from scratch. When Lucy went on to have her own family, she didn't carry on that tradition. She raised three fabulous children (one of whom I married) but none will remember her for her culinary skills. My husband jokes that even today, at age 83, her diet is similar to that of our 20-year-old son: fast food, anything fried, and anything sweet. And she is no locovore. The further the food is from its source the better -- she recently gave me a dozen eggs that were purchased directly from a farmer, saying she preferred to get hers from the supermarket. Last week, short on time before our visit, I whipped up a Kitchenette Cake, a simple one-egg cake with a broiled icing. 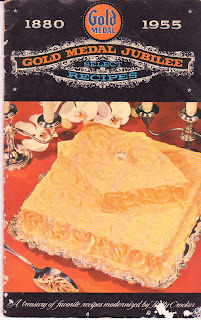 The recipe, originally from 1890, was updated to 1955 standards in the Gold Medal Jubilee cook pamphlet, "A treasury of favorite recipes modernized by Betty Crocker." It's a delicious cake; DH says it's his favorite (but he says everything is his favorite). 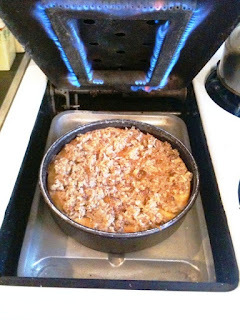 While I normally follow these old recipes to the letter, I cheated on this one. 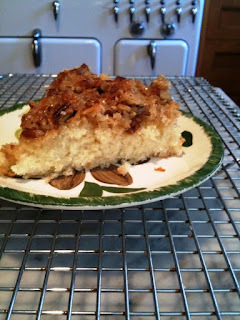 Knowing Lucy would love more sweetness and more of a "candy" topping, I embellished the broiled icing with extra butter, sugar, nuts and coconut. Both she, and her companion Perdy (she's perdy good, says DH) enjoyed the cake. Margaret: I *always* use butter (except in pie crusts when I use leaf lard). Butter does have a superior flavor, but I think the texture of cakes is moister if one uses oil or Crisco. 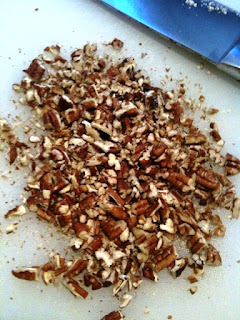 (The red velvet cake that I make uses no butter, only oil, and everyone raves about it.) I think I know that Cake Bible recipe...it's some kind of vanilla cake, right? The secret to her cakes is not to overbake them (which is very difficult to do, but when she says the cake should come away from the side of the pan only after it's removed from the oven, she means it!). 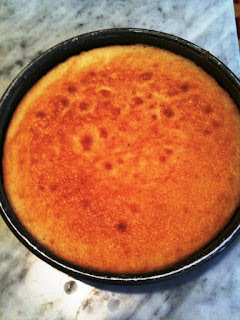 That said, I made her country buttermilk cake once for someone, and the entire center of it was not cooked enough. I cut out that part and filled the "hole" with strawberries. I do think Mr. Wonderful is wonderful for baking you guys a vd cake! It was a yellow cake. I will pass your tips on to Steve. He was surprised it was dry because he kept a close eye on it.